Six years ago today Hurricane Sandy made landfall, leading to more than 100 fatalities and $70 billion in damages across a dozen states. In New York City alone, the storm resulted in more than fifty lives lost, millions of traumatized residents and billions of dollars in property damage, along with extensive loss of income and productivity. While Battery Park City fared better than many other affected areas of New York City, it nevertheless sustained millions of dollars of damage to Pier A Harbor House on its southern end, as well as to the BPC Ball Fields and Asphalt Green Community Center in the north as storm surge waters poured in from West Street on BPC’s eastern boundary. 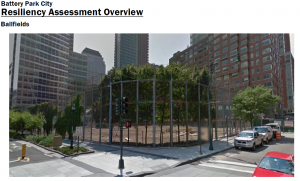 Today, the Battery Park City Authority continues its resiliency efforts as informed by both its 2015 Resiliency Assessment – which identified all BPC flood vulnerabilities and recommended area and point flood protections – and its 2016 Wagner Park Assessment, resulting in a resiliency concept to connect with the City’s downtown resiliency measures on the eastern side of lower Manhattan (also known as Lower Manhattan Coastal Resiliency or “LMCR”). 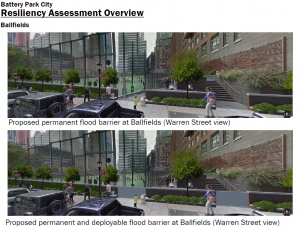 In all, BPCA is now proceeding with four interrelated resiliency projects to protect Battery Park City from the threats of storm surge and sea level rise. 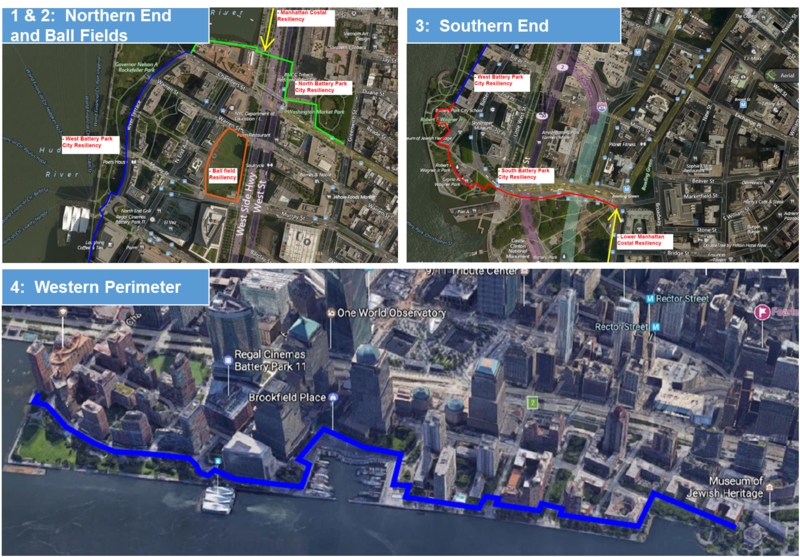 The South Battery Park City Resiliency Project, contemplates creation of a continuous flood barrier from the Museum of Jewish Heritage, through Wagner Park, across Pier A Plaza, and along the northern border of Historic Battery Park, to a higher elevation point at State Street, where it would be positioned to connect with LMCR efforts. The rough outline of this protection can be seen in red in the “Southern End” snapshot pictured above, with additional conceptual renderings available here. After a competitive procurement, AECOM was selected to lead the design and engineering phase of the South BPC Resiliency Project, with the first of a planned series of public meetings scheduled for Thursday, November 1 at 6 River Terrace. 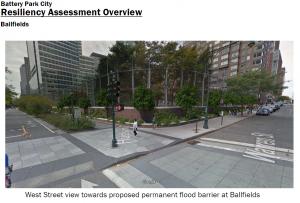 The BPC Ball Fields Resiliency Project envisions the design and construction of an independent, permanent flood barrier system along the eastern, northern and southern boundaries of the BPC Ball Fields. Conceptual renderings of what these measures may look like are as follows, with the first in a series of planned series of public meetings scheduled for Monday, November 19 at 6 River Terrace. 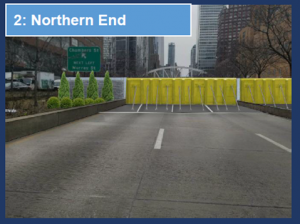 The North Battery Park City Resiliency Project will cover BPC’s North Esplanade and entail a deployable barrier crossing West Street / Route 9A. Development of a Request for Proposals for this project is underway, with an expected release by the end of the year. 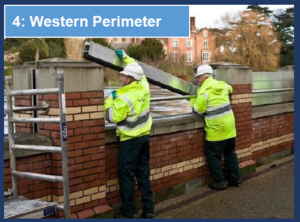 A rough concept of such barriers may be seen as follows. An RFP for this phase will be developed for release in 2019, with engineering design and construction to follow. Video of resiliency project updates from BPCA’s recent Open Community Meeting can be found by clicking here. A report on resiliency project status is also part of each meeting of the BPCA Board. Six years after the devastation of Hurricane Sandy, hardening of Battery Park City for the next storm remains BPCA’s top priority. With a wide range of stakeholders at the state, local and neighborhood levels we look forward to furthering this challenging and essential work.